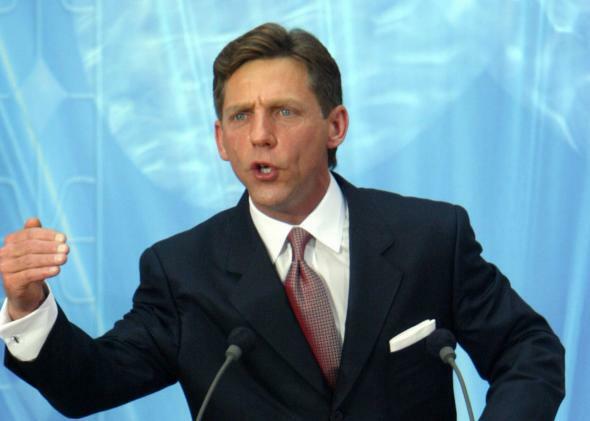 Report: Scientology leader David Miscavige spied on father Ronald Miscavige Sr.
Live and let die: David Miscavige speaks during the inauguration of the Church of Scientology in Madrid in 2004. Private detectives told Wisconsin police officers that they spent 18 months spying on David Miscavige’s father on behalf of the controversial Church of Scientology leader, according to police reports made public by the Los Angeles Times. In addition to tracking Ronald Miscavige Sr. and monitoring his communications, Florida private investigator Dwayne S. Powell told police that David Miscavige instructed him to “let him die and not intervene in any way” when it appeared that the elder Miscavige was having a heart attack. Powell was arrested near Milwaukee in 2013 with an arsenal of weapons, including an illegal silencer, and soon told investigators that he was in town to conduct surveillance on Miscavige Sr. and that the Church of Scientology was his employer. He was eventually placed in a pretrial diversion program for the federal weapons charge. According to the reports, Powell told police they were monitoring Miscavige Sr. because he had recently left the church. “They advised that Ronald’s son, David Miscavige, the leader of the Church of Scientology, is obviously having them watched because they left the church two years ago and David is afraid that Ronald will speak with the media about the negative inner workings of the church and David’s abuse of the members of the church,” according to one of the reports acquired by the Times. Scientology has come under fire in recent weeks after the airing of an HBO documentary featuring numerous former Scientology members documenting abuses—including spying on former members—at the hands of the church and Miscavige. The organization denied the latest charges. “Please be advised that Mr. Miscavige does not know Mr. Powell, has never heard of Mr. Powell, has never met Mr. Powell, has never spoken to Mr. Powell, never hired Mr. Powell and never directed any investigations by Mr. Powell,” Michael Lee Hertzberg, Miscavige’s attorney, told the Los Angeles Times in an email. Another attorney for the church, Gary Soter, called the accusations “blatantly false,” but wouldn’t respond to the Times’ questions about Miscavige’s relationship with his father. While the church is alleged to have had the investigators attempt to read Miscavige Sr.’s emails at the library, eavesdrop on his conversations at restaurants, search his garbage, monitor his phone calls in cars, and track him via a GPS device placed on his car, the most disturbing incident is the reported response to the apparent heart attack. Once, while tailing Miscavige on a shopping trip, Powell and his partner watched him grasp his chest and slump over while loading his car. After his arrest, Powell told police he’d thought Miscavige was having a heart attack and might die. He said he phoned his intermediary for instructions. Ironically, Powell’s partner in the investigation was his son Daniel, who corroborated the story that the father-son pair were spying on the senior Miscavige on behalf of the younger Miscavige in a statement to the police, according to the Times.